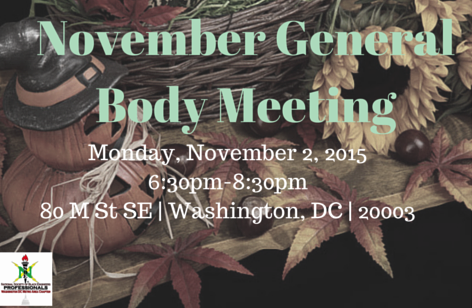 Join NSBE DC for the first General Body Meeting (GBM) for the year on Monday, November 2, 2015 at 6:30pm at BAE Systems, 80 M St, SE, Washington DC 20003! Learn more about exciting features, programming, and committees to get involved with for the year via committee working groups! Food will be provided, along with networking from 6:00pm-6:30pm!